Colordyne 1600 Series C Roll-to-Roll Inkjet Printer | Arrow Systems, Inc.
On demand secondary labeling and AIDC applications have never been easier with the Colordyne 1600 Series C. Colordyne’s digital printing platforms offer fast, flexible and scalable solutions, perfect for reducing cost and eliminating pre-printed label inventories. 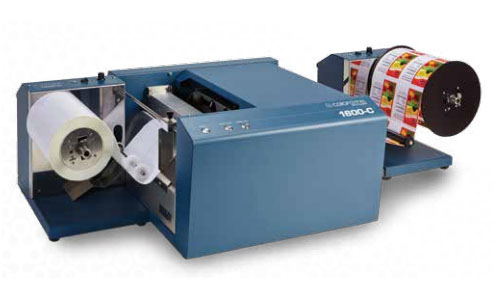 In one convenient step, the 1600 Series C produces high-quality process color labels and tags and integrates variable data – allowing for brand owners, private label manufacturers and label converters to print exactly what the job calls for, large or small. The 1600 Series C can be easily set up for the following printing formats: roll-to-roll, roll-to-cut, and fan fold; making for quick set-up and change-over between jobs. Seamlessly merge designs and layouts with text, images, barcodes and database information to handle the needs of security packaging, tracking, personalization, and micro-segmentation. Perfect for any type of consumer based labels, such as food labels, cannabis labels, e-juice labels, and much more! The Colordyne 1600-C label press is the ideal solution for in-house label printing. With the ability to print on continuous media as well as pre-cut media, the 1600-C is the perfect addition to any label printing operation. High-resolution MEMJET printing technology allows you to create full-color labels in 1600 x 1600 dpi in the blink of an eye!